Stanley Stankavich, born in Kaunas, Lithuania in 1884, immigrated to South Bend, Ind. in 1910 after working 12 years (since the age of 14) in the mines of Scotland. Frances Missavich, born in Kaunas in 1890, immigrated to South Bend in 1904, when she was 14, to work as a domestic. 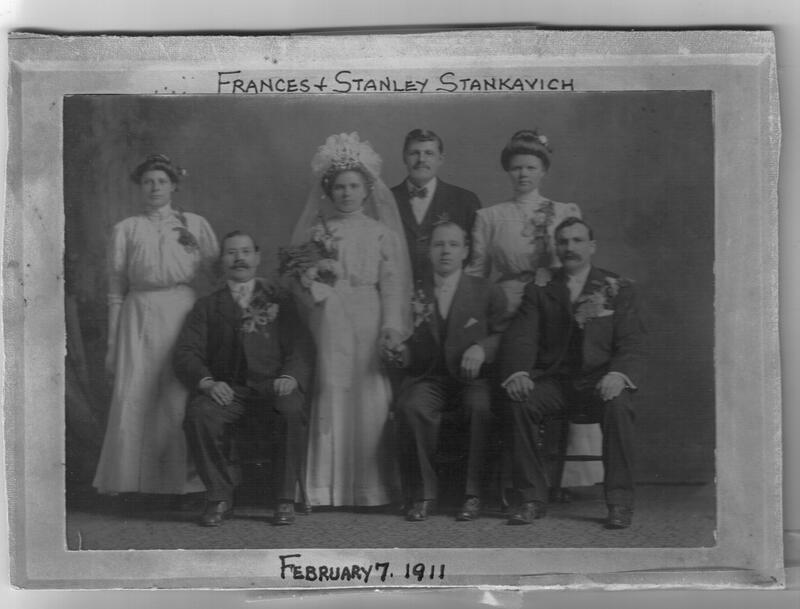 Stanley and Frances married in 1911 after an acquaintance of one year, when he was 27 and she was 20. Some time later, the couple moved to Springfield, where Stanley worked in the Citizen and Peabody Mines on the city’s north side. The family went to St. Aloysius Church and lived on north 11th Street, near the Illinois State Fairgrounds, where many other Lithuanian and Polish mining families lived. The couple had five daughters and one son. Daughter Nellie (b 1913, died 1974) had two sons, Michael (who died as a newborn) and Mark Bartashies. 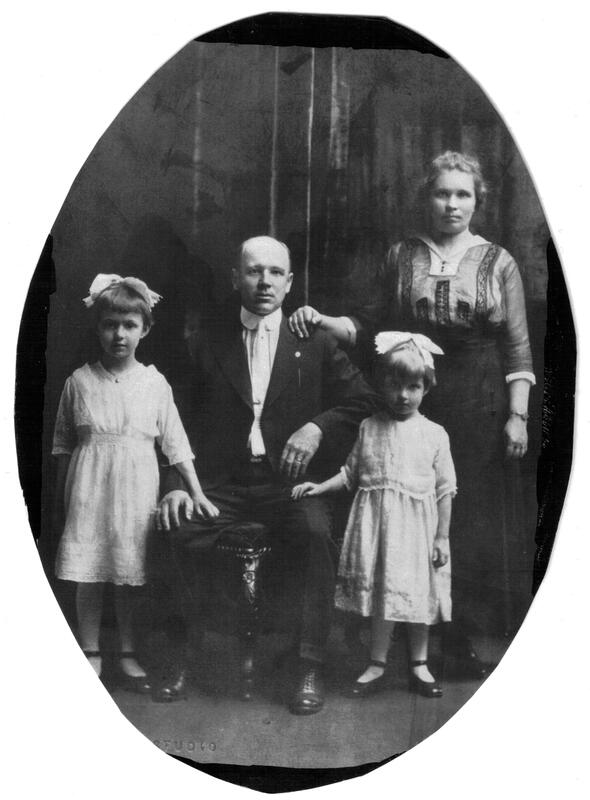 Daughter Stella (1916-87) married fellow Lithuanian-American Adam Sockel and had a son, Ronald (1938-88). Daughter Victoria (1922-81) married George Blaskie (1918-85). Daughter Frances (b. circa 1925) married Elmer L. Cartwright and had a son, Dennis, two grandchildren and two great-grandchildren. Daughter Eleanor (1927-98) married Harry Bietsch and had a son, Eddie (1950-99). Daughter Martha (1929-92) married Walter Alcorn and Henry F. Long. And son Stanley (1931-80), a Korean War veteran, went to college on the G.I. bill and worked in early information technology. Frances “Fritzi” Stankavich Cartwright, a founder of the Lithuanian-American Club, remembers how her immigrant father, Stanley, was unable to read or write, but in 1938 became a U.S. citizen after taking citizenship classes and learning to write his name to sign the citizenship pledge. “I remember how he used to practice writing on any scrap of paper he could find around the house, mostly matchbook covers,” Fritzi recalls of her father. On the proud day of his swearing in, Fritzi says he returned home with a small American flag, gathered all his children and had them recite with him the Pledge of Allegiance to the Flag. In high school at Lanphier, Fritzi worked after school at Bressmer’s Department Store downtown to help support the family. After graduating, she worked at Franklin Life for four years before marrying Elmer, a Navy veteran of World War II whom she had known since second grade, in 1947. After the couple’s son Dennis was old enough, Fritzi went to work at Sangamo Electric Co. on North Ninth St.
Fritzi has many happy memories of growing up between the Wars, of how people had less but were more involved with neighbors. She remembers that neighbor boys who used their bicycles to deliver newspapers would lend their bikes to other children. She remembers playing baseball in the neighborhood and baseball, basketball and tumbling in high school. One sad memory is the death of her mother, Frances, of kidney disease at the age of 57, the same year Fritzi married her beloved Elmer, who also died prematurely in 1986. Many of Fritzi’s siblings, their husbands and children also died before their time, in middle age. Fritzi was a founder of the Lithuanian-American Club in 1988 and has served the Club as an officer and board member over many years.